At Catering Appliance Superstore we pride ourselves in our provision of all of your catering needs. 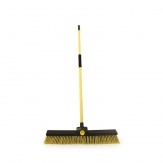 Our large range of dustpan and brush sets, v-sweepers, mops and assorted cleaning brushes is indicative of this aim. In all aspects of maintaining your premises there are specific requirements when it comes to cleaning up spillages, dusting and cleaning. We provide colour coded dustpan and brush sets as well as colour coded nail brushes, scrub brushes, hand brushes and hygiene dishwasher brushes. For those more awkward spillages, long handled dustpan and brush sets and long handled cleaning wands and mops are available to avoid the need for excessive bending or direct contact. We also provide v-sweeper dustbusters to make maintenance of floors a breeze. Our range of dustpan and brush sets ensures we can provide for all of our customers needs and prepare them for any awkward cleaning tasks.